Headquartered at SERC, a coalition of partners across the U.S. and Canada is working to conserve North America's 200-plus native orchid speces, through preservation, propagation and education. Orchids are among the most threatened plants on earth as a result of habitat destruction and collection from natural habitats. In North America, more than 60 percent of the approximately 210 known species are threatened or endangered in some part of their range of distribution and a number of species have been extirpated in some states. The Orchidaceae represents one of the most important plant families in the world from an economic and horticultural point of view. Flowering orchids of a few species and hybrids are readily available commercially but the genetic diversity they represent is not close or similar to the genetic diversity of native species. Orchids are amazingly interesting ecologically. The orchid family is the only plant family whose members have all evolved to gain necessary resources by digesting fungi, and successful conservation efforts will require consideration of the fungi as much as the orchids. 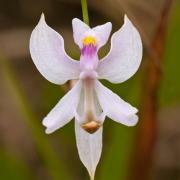 The North American Orchid Conservation Center is the only continental-scale organization in the world devoted to conserving orchids through an integrated and collaborative effort that is based on an ecosystem approach to understanding the interactions between orchids and their mycorrhizal fungi.